A team of high school students from Story County 4-H, Team Neutrino, designed and constructed a robot to compete at the Iowa Regional FIRST Robotics Competition in Cedar Rapids, Iowa on March 21-24, 2018. The team ranked second and finished in the finals. Team Neutrino also won the Engineering Inspiration award which “celebrates outstanding success in advancing respect and appreciation for engineering within a team’s school and community.” This award qualifies the team for the World Championships in Detroit, Michigan on April 25-28, 2018. The team also was awarded a $5,000 sponsorship from NASA. Brian Steward, professor in the Department of Agricultural and Biosystems Engineering (ABE), is Team Neutrino’s lead mentor. These students worked many hours in ABE and in the Department of Mechanical Engineering’s Boyd Lab. 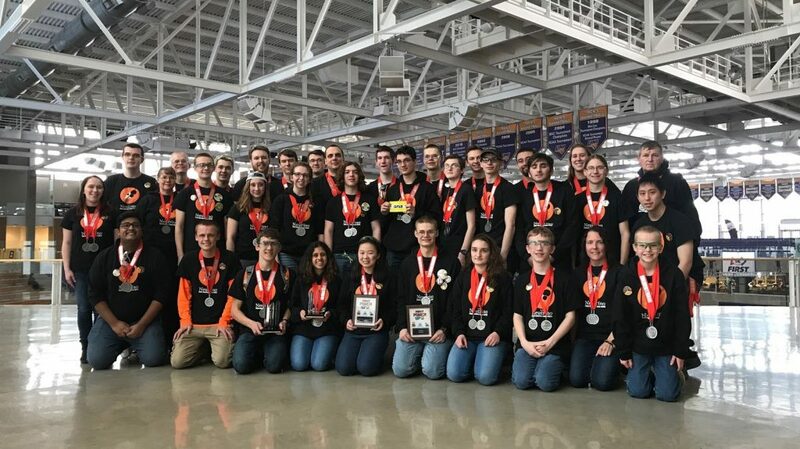 “The FIRST Robotics Competition gave these high school students engineering, design and teamwork experience that is off the charts. The inspiration that FIRST develops within students to pursue STEM career paths is unmatched,” said Steward. Their season started on January 6, 2018. Team members worked up to 26 hours each week outside of school hours to build their robot. The team has 16 sponsors and partners: CIT, John Deere, Quality Manufacturing, Danfoss, Monsanto Fund, Alliant Energy Foundation, Theisen’s More for Your Community Grant, Interstate All Battery Center, Ames Electric, Triangle Fraternity, Jimmy John’s, RTP Company, Iowa State 4-H Foundation, Story County 4-H, Boyd Lab, Iowa State Society of Manufacturing Engineers, Iowa State College of Engineering.